I'm loving this time of year. Most people love it because summer is coming up, but I love it because of the strawberries!! The local strawberries this year are completely insane. And by insane, I mean fantastic. We have these roadside stands where we can buy them from a local farm. They just started selling last week and I've been by the stand three times already. My first trip there I bought some strawberries with intentions of baking, but they were so darn good, we ate most all of them. I saw these muffins on Squirrel Bakes several years ago and wanted to make them ever since. I made changes to the cream cheese filling, but kept everything else the same. The muffin batter seemed really thick to me so next time I make these, I may try increasing the milk amount to one cup. Either way, I love the combo of the fresh strawberries and the cream cheese. Preheat your oven to 400 degrees. Line a muffin pan with baking cups or grease generously. Make the streusel topping first by combining flour, sugar, and cinnamon in a small mixing bowl. Then, using a pastry cutter or forks, cut in the butter until the mixture looks like coarse crumbs. Set aside. Now for the cream cheese filling, in a medium-sized mixing bowl, combine the cream cheese, powdered sugar, and extract and mix until well combined. In a large mixing bowl, whisk together the milk, oil, and egg. Next, add the flour, sugar, baking powder, and salt and stir until just moistened. The mixture will be lumpy. 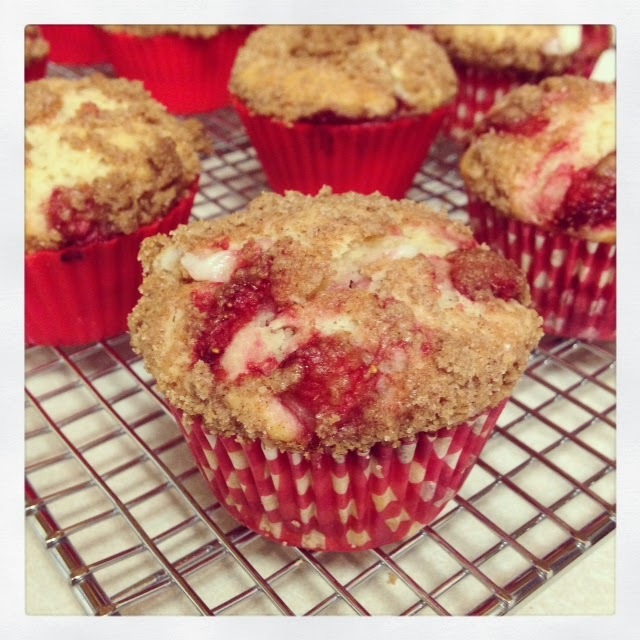 Spoon in about one tablespoon of muffin batter into each muffin cup and then top with half of the diced strawberries. Then top the strawberries with the cream cheese mixture (about a tablespoon). 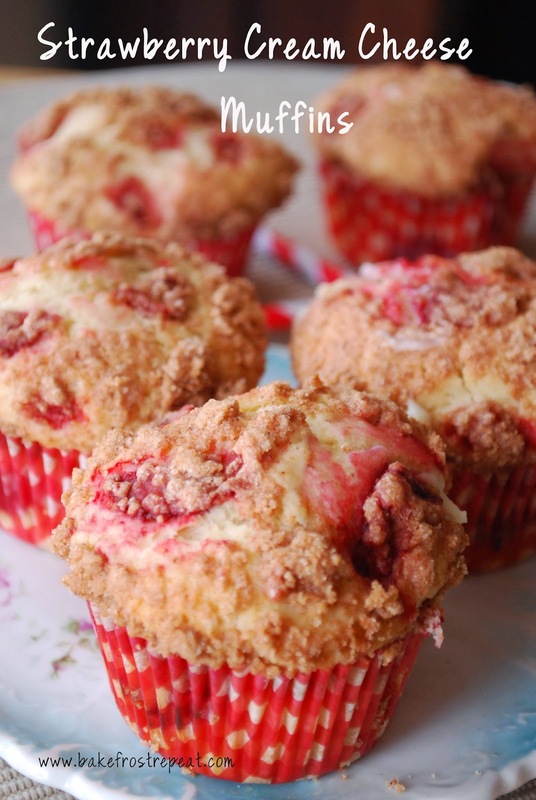 Spoon the remaining muffin batter into each cup and then top with the remaining strawberries and then sprinkle the streusel topping on top. Let cool in the pan for about 3-5 minutes, then transfer to wire rack to cool further. If you can't wait to sink your teeth into one of these babies, REMEMBER, the strawberries are hot, hot, HOT!! This recipe made 12 muffins for me. Oh, these look SO divine! I'm thrilled that fresh strawberries have started showing up back at the farmers markets and these are such a great use of them! Ooh, lucky you! Fresh strawberries that are juicy and sweet - I could eat a whole carton. I'd rather have them in these muffins though! They look amazing, Shannon! There's nothing like real strawberries from a farm! I love this idea with the cream cheese, that's my weakness! We are so lucky that Tennessee strawberries are the best! These look fantastic. I simply cannot resist a streusel top.